I know there are a lot of plugins out there that do this well and I am not really interested in competing against them. I just want a simple door and window plugin that I can integrate tightly with my other plugins. The global settings will allow the user to set up the defaults for all of these settings and others. The window location and size will be selected via three points with a preview vector showing the exterior facing direction in some sort of fashion. I haven't thought through all of the advanced options yet but mullions will probably be one as well as other embellishments. Doors get a bit more complicated. The placement of the door jamb within the rough opening depends on the sheathing thickness on both sides of the wall, or in more precise terms the jamb depth depends on the wall framing thickness (2x4, 2x6, 2x8 etc...), the sheathing thickness (OSB, Plywood, etc...) and the interior gypsum thickness. With an interior door the sheathing is usually gypsum on both sides of the wall. A typical door jamb thickness is 3/4" with a 1/4" RO gap for shimming and squaring the door up on each side and at the top. The nominal door size is the door opening width from jamb to jamb not the actual door itself. The door width will be 3/16" of an inch less than the door opening width or nomimal size assuming a 3/32" reveal or gap for the door. With an 1/8" gap between the top of the door and the jamb this leaves 7/8" between the sub floor and the bottom of the door assuming the RO height is 2" greater than the nominal door height. For some exterior doors a taller threshold may be required so a RO height that is 2.25" to 2.5" greater than the nominal door height may be required. Please weigh in if I am missing something here. I'm am focusing specifically on standard prehung doors, sliding glass doors are a slightly different animal. 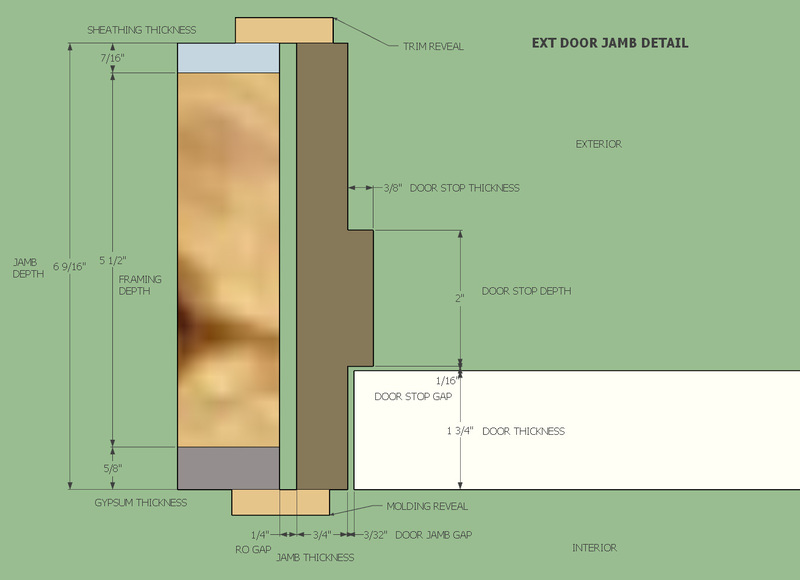 For a typical door there could be a whole host of parameters, I am thinking an html GUI would be the best with an SVG preview screen showing the door in elevation and a section detail for the jamb, threshold and header. The door location and size would be determined by picking three points similar to the window so that any size of door could be specified for a given rough opening. I'm not sure how far I will take this plugin, I was only intending to create a very simple plugin to integrate with the Wall and Truss plugins however I can see already that there is a need for a very robust and full featured window and door plugin. This plugin has been merged into the Wall Plugin. At some point I may split it back out as a separate plugin but for now it is no longer an actively developed plugin.